The DSMA by John Ehlers is an adaptive moving average that rapidly adapts to volatility in price movement. We're going to illustrate in few easy steps how to set up a DSMA-based trading system in Wealth-Lab without coding. Before anything else, install (or update) the TASCIndicators library from our website wealth-lab.com. Although it's best suited for trend-following, let's make our entry and exit counter-trend for kicks. The idea is to buy at next open when today’s closing price has crossed a percentage below the 40-period DSMA. The opposite applies to exits but the percent can of course be asymmetric. Step 1. As a groundwork, open a new Rule-based Strategy and drag "Buy at market" and "Sell at market" from "Entries and Exits" tab. Step 2. From "Conditions" tab, expand "General indicators" group. 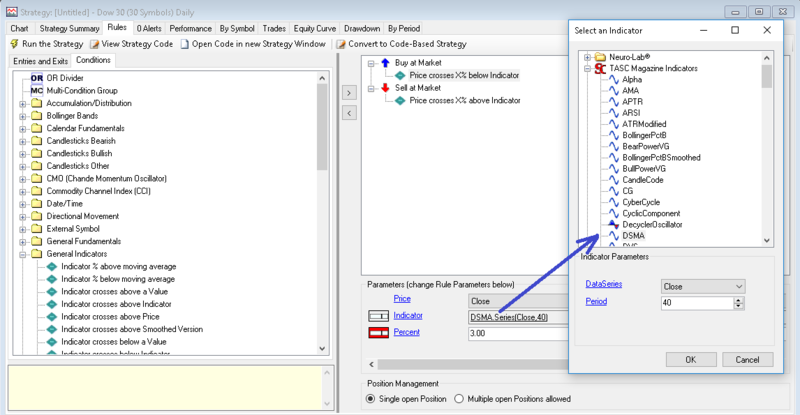 Drag "Price crosses X% below indicator" and drop it on your entry rule created in Step 1. Do the same for "Price crosses X% above indicator" and the exit. Step 3. Notice "Parameters" block below your added rules. Here you can change rule parameters. Click on "Indicator" and choose "DSMA" for both the entry and exit rules. Figure 1. Here's how to choose DSMA as the indicator. Optionally, click the icon that appears next to the indicator to expose its "parameter slider". For example, this makes possible to change DSMA's responsiveness by varyings its lookback period. As you keep dragging the slider at the bottom left of the screen, the changed trading system is re-executed automatically. Figure 2. 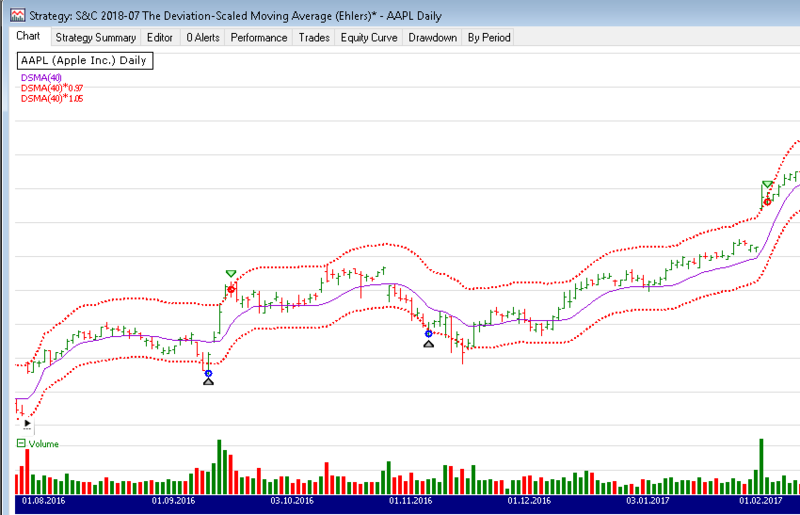 Example trades on AAPL (Apple Inc).